Plaintiffs in the seemingly eternal litigation over the hydro BiOp got their latest chance April 6 to take on recent federal filings that defended the government's salmon plan. In a series of fresh filings in U.S. District Court for the District of Oregon, the plaintiffs used more declarations to delve into the particulars of scientific disagreements with the federal analyses to hammer home one of their main points--that after more than a decade of both past actions and more current ones, fish-survival improvements predicted by NOAA have not appeared. They also argued that the feds' narrow view of what now-retired BiOp Judge James Redden required in the last remand--more specific habitat-restoration actions after 2013--doesn't mean the salmon plan didn't have many other shortcomings. They said the feds' view "does not actually reflect the scope of that opinion or the lengthy record of previous opinions, informal guidance from the Court, and letters to counsel dating back to the draft BiOp in 2007." The plaintiffs said the feds omitted any mention of criticism or concern about the analysis of habitat actions in the 2008 BiOp, "even by a group of hand-picked outside scientists that NOAA carefully guided through this review." But the plaintiffs didn't mention that the review found little scientific literature on which to guide the feds' analysis and estimates of survival benefits. The latest National Wildlife Federation brief also accused the feds of cherry-picking data and said their "rosy recitation of improvements" in the species' status is misleading. 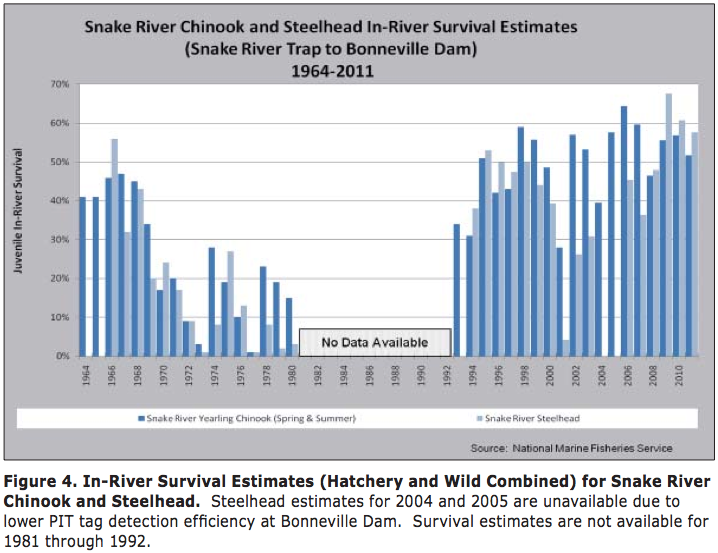 The plaintiffs cited the 2011 returns of Snake River sockeye touted in the federal agencies' 2013 annual comprehensive evaluation report, noting that only 1,100 of the 2,500 ESA-listed sockeye counted at Lower Granite Dam actually made it all the way back to the Stanley Basin, and only 146 had actually been of natural origin. "Moreover," the plaintiffs said, "wild returns in subsequent years have fallen precipitously." The plaintiffs may have picked the wrong stock to complain about cherry-picking data, since the 2014 sockeye returns set a new record, with more than 1,000 hatchery-origin and 460 natural-origin adults making it all the way home. More than 600 redds were counted in Redfish Lake. In 1999, only eight were counted. Some of the plaintiffs' arguments date to 2008, when they began litigation against the first version of this particular BiOp. The jeopardy analysis is a case in point. It has been used by the feds since then and is still under assault, although it was never thrown out by Redden. "NWF has explained that the 2008 BiOp jeopardy analysis does not rationally account for the very large uncertainty in its quantitative predictions about the effects of the [Reasonable Prudent Alternative]," said the latest filing, which cited declarations made by the plaintiffs' experts from 2008. The brief noted that NWF "has explained how the updated analysis in the 2014 BiOp reverses direction and seeks to make this very large uncertainty the centerpiece of an analysis to show that the RPA is performing as predicted," and that "NOAA's lead response is that the Court must defer to its analysis." NWF concluded, "Appropriate deference, however, is not a shield for arbitrary agency action." The plaintiffs argued that the updated analyses in the 2014 BiOp "either fail to address NWF's points or rely on cherry-picking a few facts in an effort to support its position without providing the full picture--which is consistently much less favorable." They took yet another shot at the pace of estuary and tributary habitat restoration, citing their declarations to claim that NOAA has produced little evidence to show that it will accomplish the level of estuary restoration needed, nor achieve the survival benefits it has estimated will accrue from the actions. Another problem, according to the plaintiffs, is the BiOp's failure to address effects of climate change by not including a quantitative or qualitative evaluation of how it stacked up against recommendations by the region's independent science panel. They claimed NOAA has "double-counted" other actions to improve fish survival as mitigation for impacts of climate change. The plaintiffs also took the feds to task for claiming that critical habitat in the mainstem Columbia/Snake rivers is functioning. "This new assertion in its summary judgment memorandum is based on a discussion of a litany of structural modifications to the dams and a purported decrease in juvenile travel time to the ocean," the brief said. "This theme forms much of NOAA's argument on critical habitat: trust us because critical habitat for listed salmon and steelhead is getting better under the RPA--although NOAA tellingly never mentions that for all the new structures at the dams, the 2008/2014 BiOps allow actual flow and spill conditions in the mainstem to become worse for fish than they have been in recent years." The federal agencies have said they will operate the dams this year similarly to the court-ordered mandate in previous years. But the newest BiOp calls for barging fish earlier and changing the transition date from spring to summer spill (when 95 percent of juvenile wild spring Chinook are estimated to have passed). This action, in effect, reduces spill at a couple of lower Snake River dams a little earlier, but puts more spring Chinook and steelhead in barges, a strategy that is expected to "slightly increase the number of adult returns," National Marine Fisheries Service staffer Ritchie Graves said in his March declaration. The plaintiffs also argued that the federal agencies have failed to complete an EIS on proposed actions in the 2014 BiOp, which would require a "full range of alternatives" to current operations. The defendants have argued that a separate EIS for each of the 74 actions in the RPA would be impractical, and that each action is independent and not connected enough to fall under a single EIS. But the plaintiffs said the feds have characterized the BiOp as a "suite" of actions that must all be completed to avoid jeopardy. The NWF brief also said NOAA came up short in its analysis of FCRPS effects on ESA-listed killer whales that found the hydro system had little impact on the favorite food for the listed orca pods from Puget Sound, since the current number of hatchery Chinook likely replaced the number of Chinook killed by ongoing BiOp-mandated hydro operations. Noticeably absent from the latest briefs is any mention of an issue brought up by Northwest RiverPartners in its March filing, which pointed out the state of Oregon had accepted the very same federal jeopardy ruling in the 2008 Columbia Basin harvest BiOp that it was calling illegal in the hydro BiOp case. BiOp defendants and intervenors get one more chance to file replies, due May 6, in support of their cross motions for summary judgment. Then both sides will square off for oral arguments in Portland on June 23 in federal District Judge Michael Simon's Portland courtroom.